I’m struggling a bit to explain why private vehicle passengers has declined to significantly – perhaps they are the ones who are shifting mode to public transport to a greater extent than drivers? The Outer Urban area is reasonably “self-contained” in its trips, with a very large share of trips originating in Outer Urban areas also being destined for those areas. The CBD is a strong destination for Inner Urban areas, along with employment in other parts of those Inner Urban locations. It is worth noting the difference between the west and the south in the map above – both areas reasonably equidistant from the city centre, but with the south having much more local employment and therefore much less of an employment connection with the CBD. One would expect, post City Rail Link, for the west to be even more strongly connected and also for the south to begin to benefit from improved city centre access and the employment opportunities that will provide. Waitemata Local Board obviously stands out from the rest, with a private vehicle modeshare of below 50% and a very high proportion of people walking or cycling to work. 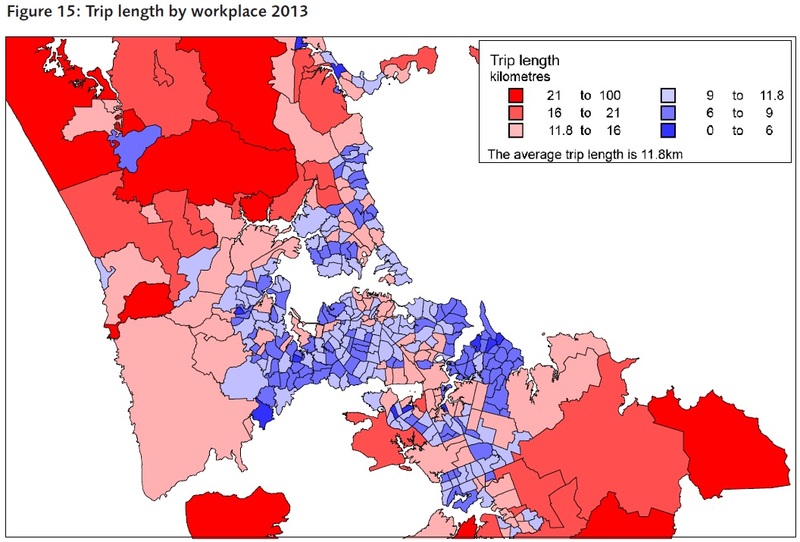 Clearly Waitemata benefits from having so many jobs located within the local board area, as well as the increasing number of people who live in the city centre unsurprisingly having a very high ‘walk to work’ share. 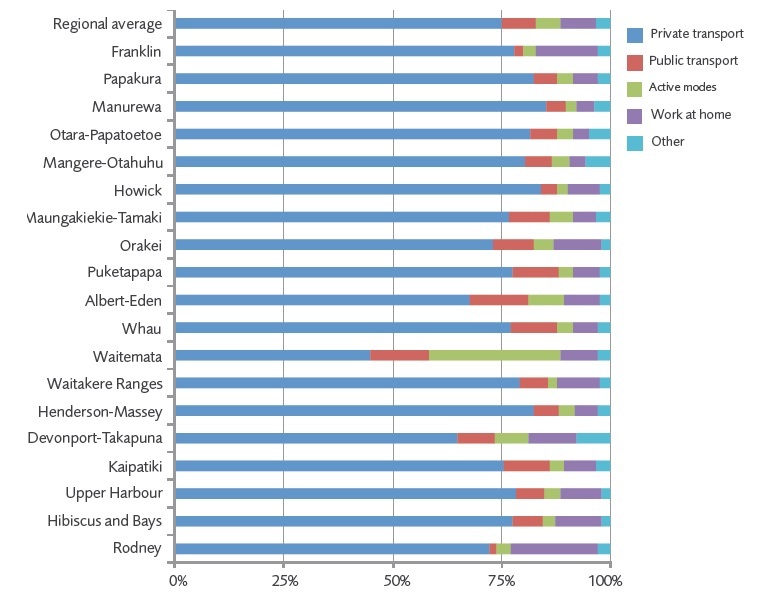 Another point of interest is how work from home varies by Local Board – higher in rural and richer areas and very low in parts of South Auckland. I guess this reflects most ‘work from home’ jobs being either rural in nature or well-paid professional work. 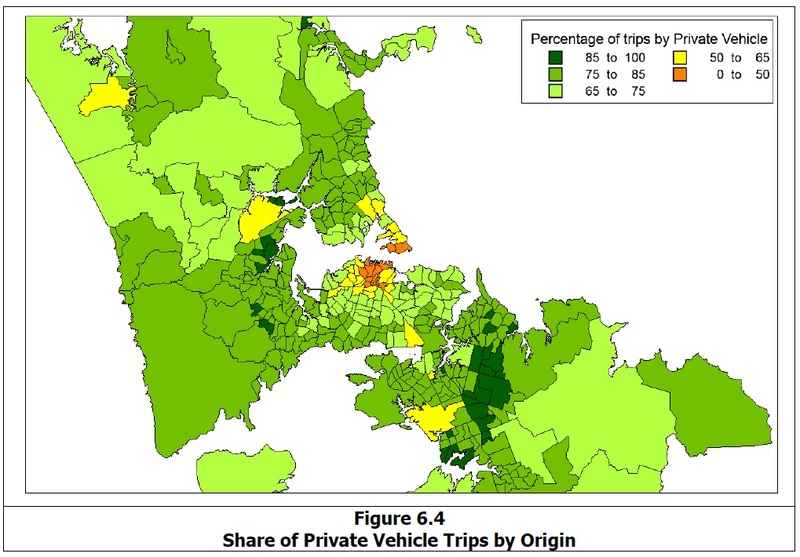 This finding is unsurprising and a core part of why urban sprawl concerns us so much, because people living in far flung parts of Auckland need to travel a very long way to work – which is both expensive and places a lot of pressure on the transport network. It’s also clear that West Aucklanders are stuck with long commutes more so than most other parts of the city – highlighting once again the huge benefit City Rail Link will bring to the west as well as the need to increase the level of employment available in that part of Auckland. 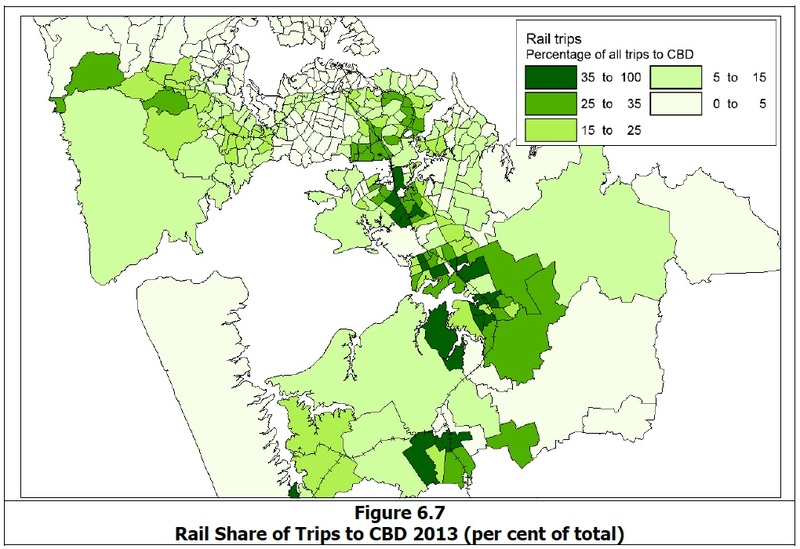 Looking at the above map it’s quite telling to see how along the inner parts of the Western Line, rail is capturing a pretty low proportion of CBD-bound trips – I imagine due to the very long an convoluted path the train takes via Newmarket. With the City Rail Link in place there’s some huge growth potential in these areas for much higher levels of train use as there’s a pretty huge untapped market at the moment. 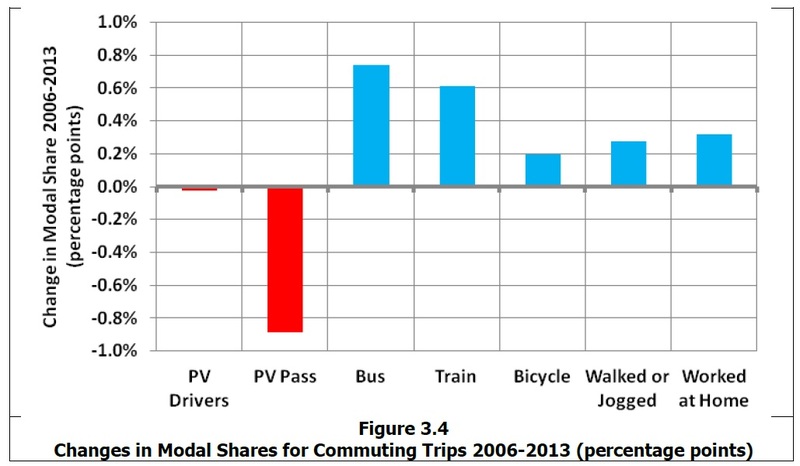 Looking at overall public transport modeshare, the dominance of the isthmus is quite clear. This is a large reason why we were so frustrated to see intensification on the isthmus watered down in the Unitary Plan to such a great extent last year. Why might private vehicle passenger trips have decreased so significantly compared to all other modes of getting to work? What impact might CRL, Airport Rail, AMETI and other major projects have on these patterns over the coming decades? What’s up with Stonefields? – its travel patterns are much more like an ex-urban piece of sprawl than a fairly dense inner-urban suburb. 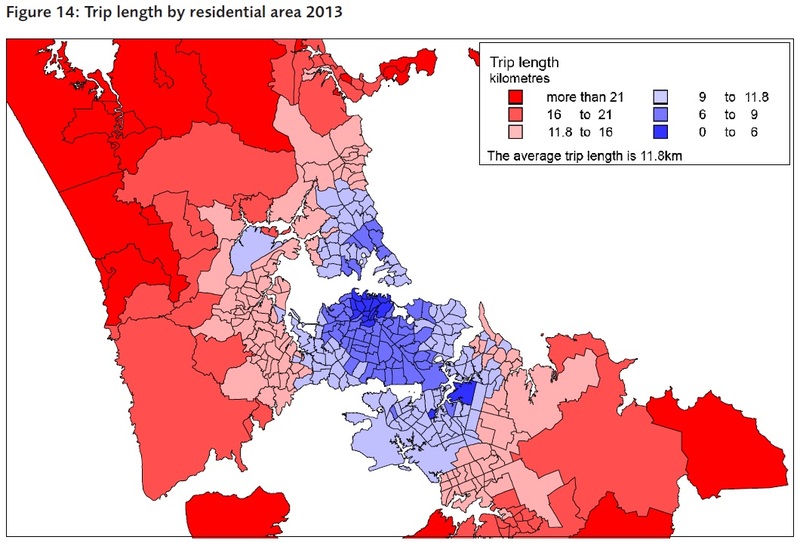 That length of journey to work by place of residence does indeed tell a compelling story. It’s surprising with so much employment in the south that commutes are still quite long. A direct result of employment dispersal; households can’t share journeys to work/education when they are in two different directions. How is this hard to understand? More dispersal of living and employment/education/entertainment leads to more travel not less. This is why occupants of more sprawled cities spend more per person on travel than those in compact cities. And these cities spend more on infrastructure to enable this, and huge quantities of land is given over to driving and parking [which is why the cities that do manage this are general on flat featureless plains surrounded by low value land, oh and it helps if the nation is an oil producer too; yes Houston that’s you]. People in these cities do much more driving, are fatter, sadder, and die sooner. I have another (or complimentary) theory: some of those passengers bought a motorbike or a scooter. As we saw in a post a while ago these vehicles numbers are increasing. So people who has jobs dispersed bought a two wheeler instead of a second car. That might also explain why car pooling hasn’t taken off – not as easy to find people with shared destinations. Another related factor is flexi-time working, so even if they work in the same area, they don’t start or finish at the same time. Flexi working hours do make it difficult, specially floating finish times. As someone who briefly tried this, the finish time was the killer; either I needed to work late, or my passenger did, which meant we both ended working late almost every night. One thing we need to constantly repeat when looking at these figures is that they tell only part of the story. One hugely critical group not measured by this for example are people travelling for education. In Australia the question on the Census is ‘Journey for work or study’. 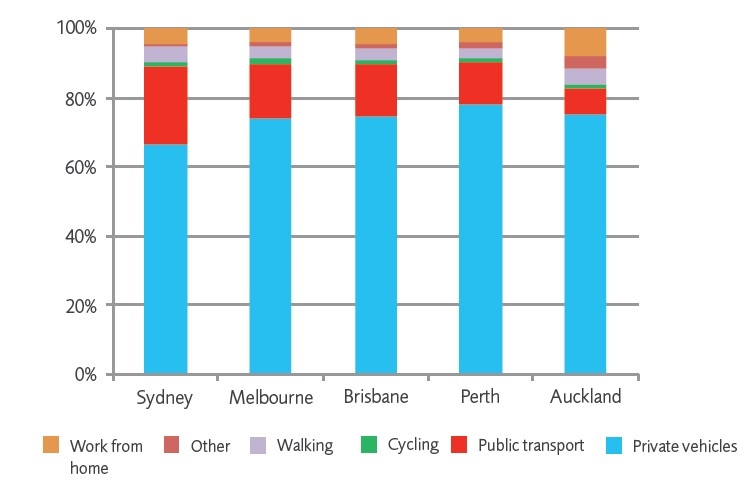 This omission alone hugely overstates the importance of private car use as a proportion of travel demand in Auckland. I fail to see why the ‘for study’ question can’t be added to the census as a separate line, so that wouldn’t change the continuity with historical data but would add a hugely important data and make the results more meaningful. We also need to repeat constantly that the census asks only about the main means of transport to work, which means that walking (or cycling) to the bus or train, or walking from the car park, are not included. For every PT journey and many car journeys there will be associated walking trip legs (appropriate terminology! ), so there is a lot of unrecorded active-mode travel. These changes in share percentage variations are fairly small, so how do we know they’re actually statistically significant? Interestingly a search of the entire report doesn’t find the words “margin”, “error” or “statistically”. > statistically significant? Interestingly a search of the entire report doesn’t find the words “margin”, “error” or “statistically”. The census isn’t a sample, so there’s no sampling error, and thus every result is statistically significant. I imagine the low rail share on the inner parts of the Western Line is also down to frequency. Especially off-peak, Western Line frequencies are rubbish. Bus frequency is getting pretty good in the inner suburbs, so not only does a bus avoid the Newmarket detour, you’re more likely to find a bus when you want one. I know when I try to catch the train from Kingsland (I work closer to Britomart than Wellesley St, so I get the train by preference) at least half the time I look at the timetable and give up and catch a bus. The CRL will improve frequencies, but surely something can be done in the meantime. Maybe when we get the electric trains? There isn’t much employment in Howick and Botany, and most of it is retail, so not surprising that it’s mainly filled by locals – especially since, as you point out, it’s pretty hard to get to from elsewhere. Interesting with Stonefields, which as we know has fairly poor PT links. I said in my research (http://greaterakl.wpengine.com/2014/08/05/auckland-fuel-spending-by-area/) that Stonefields had fairly low fuel spending, but that’s a bit of an oversimplification – the data I was using was based on 2006 census boundaries, which lumped Stonefields in with existing parts of Mt Wellington, and I couldn’t separate them out. It’s quite possible that if I was redoing the research with 2013 boundaries, spending would be a bit higher for Stonefields itself – hard to know unfortunately. On the other hand, Stonefields residents do have fairly good access to shopping and a primary school on site, so probably come out a bit better for total travel than just work-related travel. I suspect that if any part of Auckland has a high percentage of company vehicles it would be Stonefields (and thus would likely have a company fuel card/fuel costs paid for by the company who owns the vehicle). The number of vehicles with commercial names and logos slapped over on them that park in driveways and garages there is one obvious sign, lots of late model, 4 door passenger cars parked in the driveways another sign. Which may be why fuel spending would look lower than expected even with 2013 Census boundaries. As the travel study showed, the residents of Stonefields still travel as far/much as everyone else – they just do the bulk of it in cars, at a level far higher than the surrounding suburbs do, so it stands out more akin to a “life style block” development located in a quarry in the city than a truly integrated suburb of Auckland. I was susrpised to see Bus growth being stronger than rail growth – this does not appear to reflect the patronage growth experienced by both modes over this time. Totally agree with the need for ‘study’ to be included in the next census alongside ‘work’. A real shame to miss out on this key market. It is also the one market within PT that has delivered stellar growth (along with SuperGolds!). In some years this has grown at over 25% year on year, albeit on a comparatively lower base (10% -20% of the various PT modes). This is still growing fast and is the key feeder for the long term conversion to PT. If we can get pricing and package offers right for tertiary and school students this will lead to a longer term change in car vs PT usage. I am looking forward to some fare innovation from AT in the primary/secondary school space as this appears to be a huge missed opportunity. What would everyone like to see if this space? Travel for education is big and I agree with Patrick that it should be included in the next census however to maintain the comparisons of existing maybe a separate question. I also feel that the fare structure needs to be changed with the Gold Card as well as the student being specifically encouraged to use the HOP system with fare discounts and maybe “family pass” add on for commuters at weekends. Getting more people to use the HOP and lower the change or one off ticketing seems to be a win all round. Is there any proposal for a Central bus interchange near or attached to Britomart so that modal change can take place without the clock off and clock on requirement. Has that been discussed for the Wiri Station/Bus interchange? You guys have got it all wrong! Tau Henare says the CRL will do nothing for people out west, so there! What a waste of space that guy was. I need to download this data or I’ll die! So almost nobody in Helensville, Waimauku and Kumeu are travelling to the CBD, yet there are thousands of car commuters pouring through Kumeu every morning, heading for Don Buck and Lincoln Roads. Just goes to show how a direct Kumeu-CBD focus for norwest PT is ill-conceived. It needs to go via the metropolitan centres of Henderson and New Lynn, as that’s where people are heading. Sorry Geoff but the facts don’t fit your speculation. 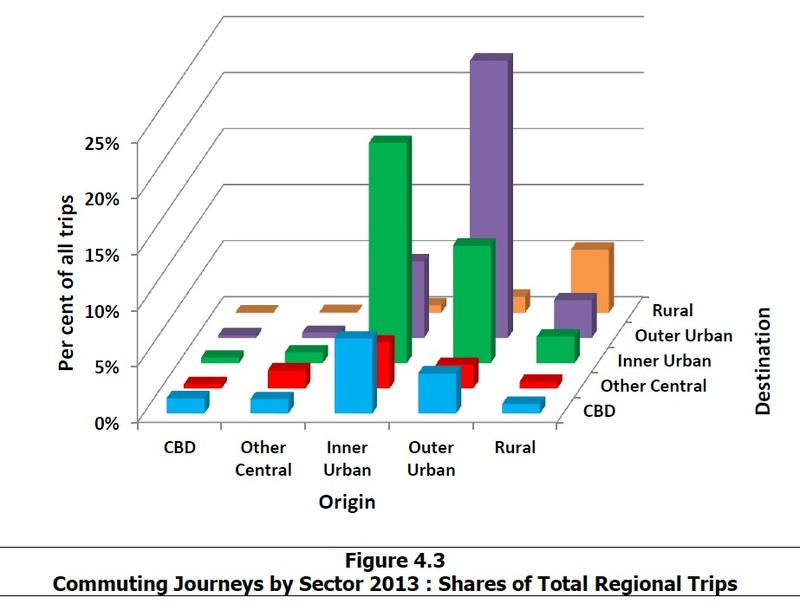 Those first two CAUs are all in the 5-10% of trips to the CBD group, while the second is in the 10-15%, correct. However that is the largest single destination outside of the CAUs themselves. And that is just the CBD core, if you add in the wider city centre including Grafton, Eden Terrace, Newmarket etc the figure would double to 10-20% (or 20-30%), if the pattern for those CAUs roughly matches the general trend. Now if you look at the full report those same CAUs are all in the 0-3% bracket for trips to the wider Henderson area. In the case of Kumeu that’s around five times the number of people working in the CBD than Henderson. 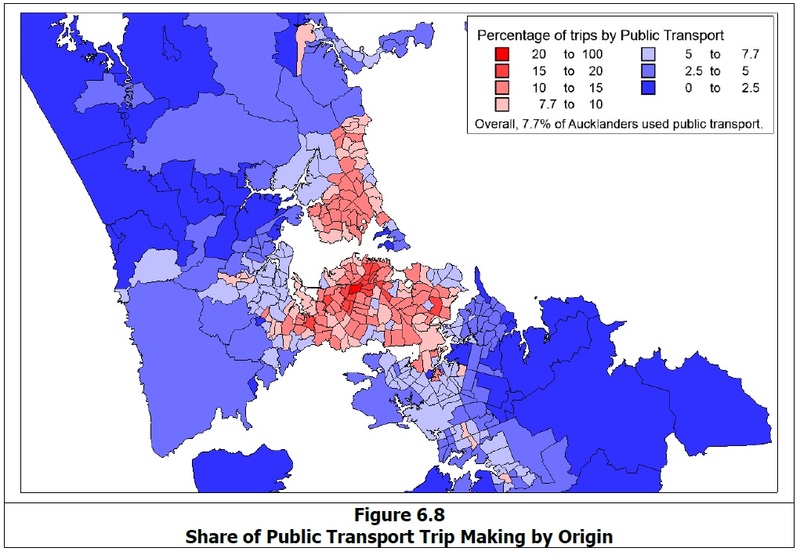 Actually a greater share of Waimauku and Kumueu residents travel to work in any one of Takapuna, Newmaket, Albany or Ellerslie than they do to Henderson. The greatest share is actually those that work at home or in the local area, after that people travel to work in the central area the most. Next is to the north shore, then the ellerslie-Onehunga-Mt Wellington area, then west Auckland. So if ‘almost nobody’ is going to the CBD for work then ‘absolutely friggin’ nobody’ is going to Henderson! The idea that “that’s where people are heading” is just plain wrong. Contrary to your suggestion the focus on Kumeu to the Central City is incredibly well conceived, because that’s where the largest by far group of commuting residents are going. But don’t fret, with the New Network that same line also provides excellent frequent connectivity to Henderson and New Lynn regardless, plus to Takapuna, Albany etc.